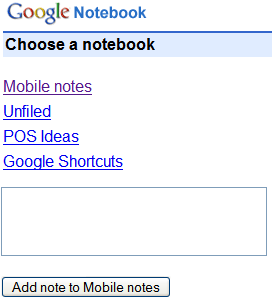 Google Notebook was one of the few Google apps that we're not available from a mobile phone. Now you can go to http://google.com/notebook/m and find a HTML version of Google Notebook optimized for mobile phones. There's also a new notebook "Mobile notes" where you can add notes directly from the homepage. The "Unfiled" notebook is a great way to access your bookmarks, but you can't add a new one from the mobile interface. Other limitations: there's no search option, you can't edit notes, add labels or change the settings. Is this a hack to compensate for Google Docs mobile being read-only? And if so, do we expect Google at some future point to merge Google Docs and Google Notebook? If this icon is a hint, I think they'll merge. After all, OneNote is a part of Microsoft Office. Ref the latter comment, an improvement would be if the 'add a note' window came at the top of the notepad you are in. Would save scrolling down to the bottom of all your notes in that notebook/folder..
What about search!? If you have a large notebook search would be very useful, I can't believe it's not there! Was waiting and missing this. I want to send SMS directly to Google Notebook - w/o having to run the browser on my SmartPhone. Any ideas? I aggree with Hal -- I want to be able to add notes by sending an SMS. -- Seems like this should be so simple. I can text events to GVENT to add them to my calander. Why can't I send an SMS to ?GNOTE? to add the verbatim text of the SMS (and maybe time info) to a new note in my notebook. okay, I made a note; now how the heck do I delete it? Click on the small blue arrow from the right corner of each note and select "Delete". Can anyone find a way to search notes from the mobile interface? Would be nice if we could add labels from the mobile interface.